CDG are at the PDM Show on 19-20 June 2018. PDM is the Plastic Design and Moulding Show. Please come and visit us to see the very latest 3D Printers and 3D Software for plastic design and manufacturing. CDG are hosting a Cimatron CADCAM user group meeting on 21st and 22nd June 2018. The meeting is free for all users to attend. The agenda is listed below. Please contact Grant Cameron or Kyla Rogers for further details. 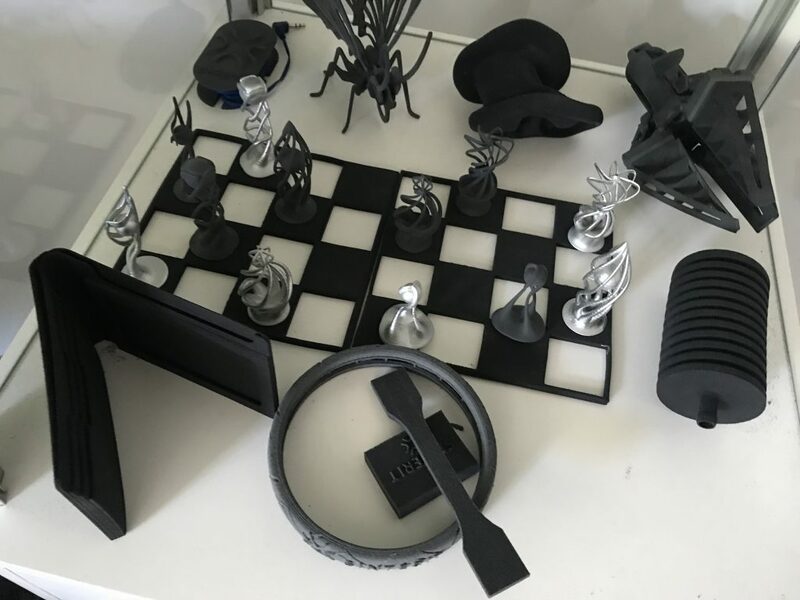 Sinterit was founded with the goal of bringing selective laser sintering (SLS) 3D printing to the desktop, opening up access to the technology. In 2015 this goal was achieved with the launch of the LISA 3D printer and, during my visit I was given a hands-on introduction to this first generation machine. Now, in the coming weeks, Sinterit is set to launch a new 3D printer. Though full details will remain under wraps until later this month, we can share an exclusive preview of the forthcoming Sinterit SLS. Robert Garbacz is a Support Manager for after sales troubleshooting and queries at Sinterit. The most important thing to remember with SLS, Robert tells me, is the direction and concentration of heat across the print bed. Polymer laser sintering is a delicate balance between the temperature of the powder bed, heated to just below melting point, and the contact of the laser. At the point where these two temperatures meet, the powder feedstock melts, then cools to form successive layers, building a finished, support free, 3D printed part. Step 1, then, is to determine the positioning of a model. The balance between bed and laser. Admittedly, for me, positioning and orientation is perhaps the hardest part of the SLS 3D printing process. However, Sinterit’s proprietary Sinterit Studio software has a number of smart features to help an operator decide on model positioning. Due to the necessity of a heated print bed, a so-called “red zone” develops at the edge where temperatures are higher than recommended. Just inside the red zone, there is a “yellow zone” that can be happily breached by the edge of some models. The “green zone” however, at the center of the build plate, is the LISA 3D printer’s sweet spot, where the temperature from all sides of the chamber reaches an optimal balance. With a 3D model in the center of the bed, the operator then needs to consider orientation. Heat rises, which can cause distortion. A part containing bridges, such as a bottle, should be placed upright with the base on the bed to avoid collapse. As a guide, Robert recommends that many parts can be 3D printed on the LISA at a 45 degree orientation across each axis – X, Y, Z. This also helps with the grade of layers in a finished part. Press print. Step 2, now the part is positioned correctly, we can begin by preparing the machine. 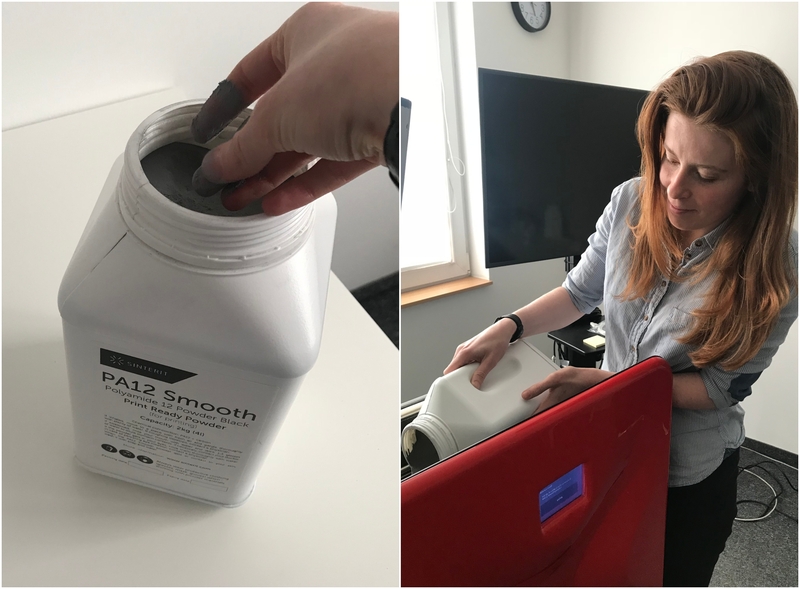 The touchscreen menu on the Sinterit LISA guides the user through every part of this process – from cleaning the laser plate through to filling the bed with fresh powder. In total, the process took around 30 minutes on my first time. 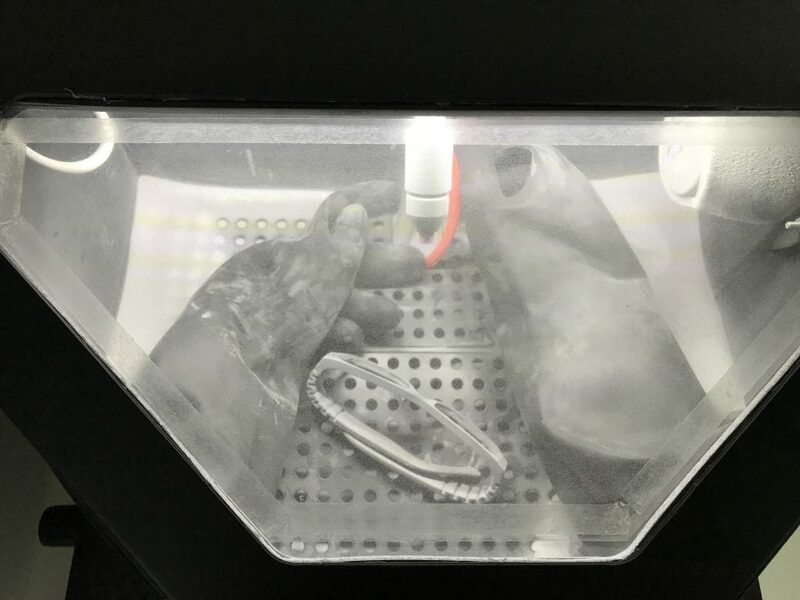 As Sinterit’s goal is to make this process as simple as possible, the company hopes that one day 3D printer will be operated at the “click of a button.” As yet though, there are many processes in the pipeline that require automation. The estimated print time for a single spectacle frame, 3D printed as a test in my tutorial, was around 20 hours, including heat up and cool off time which is typically around 2 hours either side. However, one neat thing about SLS is that other objects can be nested into the bed without causing much increase in the print time. I started my spectacle frame print at 5pm on Tuesday, and by 10am the next morning it was ready for removal from the powder cake. Optomizing workflow and starting 3D prints at the end of the day will be commonplace for users of other AM technologies. Enter step 3. As seen at the Mach Show 2018, 3DXpert really does produce some amazing results for metal printing. It has a very large database of lattices and surfaces textures for a multitude of applications. Think about weight saving, reduced print time, better strength to weight ratio, defined surface roughness for improved fluid dynamics etc. © Image taken by Grant Cameron of CDG, the UK experts in 3DXpert. CDG are demonstrating Cimatron and 3DXpert at the Mach Show, courtesy of 3D Systems on Stand H7-345. The show is at the NEC, Birmingham from 9th to 13th April. Please ask for Tom or Grant. Also, look out for the new FabPro 3D printer! With over 200 new features and enhancements, Cimatron 14 offers major benefits and more user value to manufacturing shops across their entire range of operations. From Tool design through NC programming, this latest version helps to ensure that our customers are more productive than ever, in their competitive marketplace. controlled tilting. A large number of new and improved capabilities that boost programming automation for plate machining, such as the Facing procedure, automatic Chamfer Recognition, wider Pocket Recognition capabilities and more functionality of Automated Drill as well as using templates for pocket automation. Die – New integrated incremental analysis options enable the user to accurately simulate the design, and find design flaws before the manufacturing process. Users can see whether they have carrier or material problems, non-desirable punch results or SpringBack, as well as incorrect press force definitions. New advanced Die design geometry tools such as Addendum faces and Fuzzy Offset were added to extend the application capabilities. CAD for Tooling – Many long requested enhancements in Part, Assembly and Drafting were implemented for faster and easier design. New enhancements to the Mesh kernel of Cimatron with operations such as a new robust selection tool that was introduce for Split/Copy and Add/Remove commands. In addition, Advance 3D Text capability is now available for mesh and solid. Mold & Electrode – New functions and enhancements for faster and safer Mold design such as Hole (Cooling) verification, Hole (Library) recognition and handling of ejectors with different diameters. PLM Integration with Windchill – An integration with PTC Windchill PLM system. This Integration allows Windchill users who work with Cimatron files to perform Windchill operations (such as sync, check out/in, etc.) from within a Cimatron assembly or from the Cimatron browser.